With all the recent project action in the Pantera section, it seemed like a good time to post a few images of my (still incomplete) custom induction setup for #1010. If ANY stock carb or manifold parts had come with the car I would likely have dutifully returned it to stock, I thought it would be more fun (?!!) to try something different. I wanted to run Webers, but didn't want to omit or modify the OEM jackshaft, so IDAs and IDFs were out of the question. After debating various options, DCNFs seemed to make the most sense, being compact enough to sit in the valley, allow a RH throttle pull, float bowls in the 'proper' direction, and leave the jackshaft totally untouched. Obviously no manifold was available so it needed to be welded up from whatever made the job as simple as possible. The basic concept was to adapt the top of a Maserati V8 manifold to a Ford tunnel ram bottom, but in practice the dimensions were not all optimal, and the final solution was to cut things into smaller bits and include some Aston Martin V8 manifold parts, including the forward carb perch, which was shaped differently than the Maserati design. There was still a lot of fabrication to get from circular carb outlets to rectangular intake ports and keep the transition shapes respectable in all eight runners. Also it came clear that there was no way to fit a standard distributor b/c the forward carb interfered. This was solved by going distributorless, which eliminated the need to perform an service work at the front of the manifold, where there is NO space! 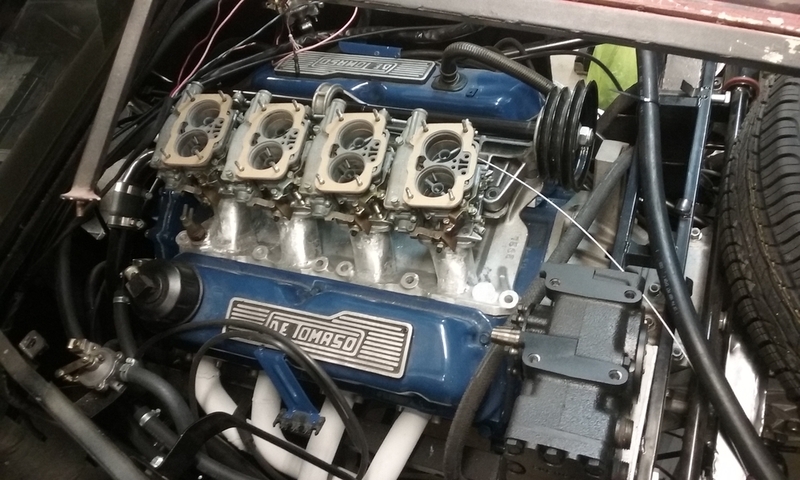 So things have only been mocked together so far, and the huge question remains if the motor will run well when everything is ready and first started. If it works it should sound great The manifold provides vacuum for the brakes but does not yet have a PCV provision, which I want to hide on the underside of the manifold. Beyond that, fingers are crossed and hopefully a real test will happen in the next few months...…here are a few pics, enjoy! Nate, this looks amazing....This is truly the way the factory should have made the car. I love the Maserati Air Cleaner box. 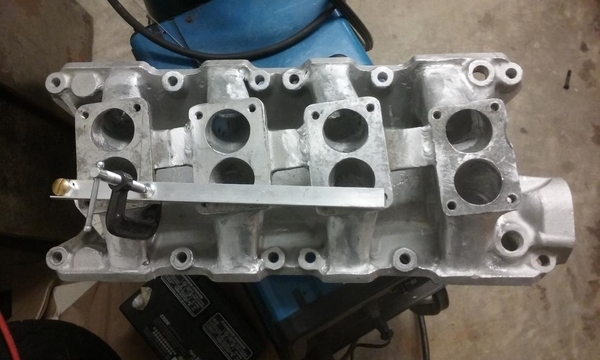 Great job with fabricating the intake manifold. The Webers, of course, look gorgeous. 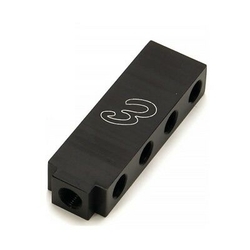 There are 8 port "distribution blocks" on the market that are perfect for the PCV manifold . Tack it to the bottom of the manifold, plumb it to all 8 runners from underneath. This one is Edelbrock #76578. Another neat trick for Webers (individual runner induction) is a separate electric powered vacuum supply for the brake booster. It eliminates the power brake vacuum plumbing as an eyesore or a plumbing issue. Providing vacuum to the booster this way is common these days for electric cars, customs, drag racing, turbo & super charger applications. A few OEMs have small, quiet, electric vacuum pumps. Add a small tank for volume & a vacuum switch to turn the pump on & off. I think there are some all-in-one units too; Audi may have one that is popular. It is possible to make this look as OEM as you have the Induction system & air cleaner assembly. Mount this vacuum "assembly" below the car, immediately under the brake booster. All that is needed is a 12 volt wire for power, and a short vacuum hose to the booster. a question . 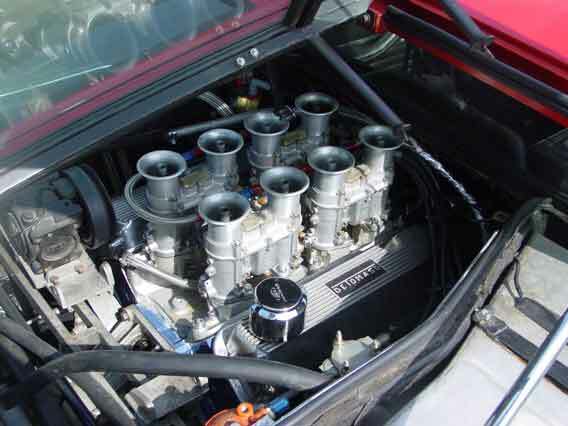 . . why are the carb mountings at a slight angle? or is that just optical illusion? have you considered abrasive flow machining ? Beautiful! Your fabrication skills are amazing! I can't wait to hear it run! The Maserati Bora has the same Weber carbs and air cleaner system. If you read thru old posts about Panteras' with webers and the problems such as not holding tune / sych, lighting filters on fire etc. I have had none of these problems with our Bora. I suspect your set up will perform similar to our Bora. If it does you will be very happy. All, thanks for your thoughts, I really appreciate the encouraging words! Re the carb angles the goal was to retain exactly what Maserati did since that allowed use of the factory throttle linkeage (modded for carb #2 only) as well as the main air box structure, as Italford recognized (different snorkels only required). I assume the reason Maserati did it was that the RH cylinder bank is slightly forward of the LH bank, so 'opposing' cylinder ports sit at that funky angle. As I recall Aston Martin has the same basic architecture, and fortuitously it's all exactly like FORD architecture...so keeping the angle was definitely the path of least resistance from a fabrication standpoint. It also promoted the straightest shot from the carbs to the intake ports. As for the extrusion machining...... I momentarily thought the video link was a preview for some new sci-fi movie. Amazing tool for sure! Nice setup!! I tried to figure out how to squeeze IDA Weber's in keeping jackshaft, OEM A/C, and OEM alternator. Didn't work. So, since motor is Boss 302, installed Boss intake with Cobra like cooling setup and small race alternator up front. With no jackshaft, left A/C disconnected. Hot rods are using 12v air conditioning compressors. Those things must be popular, both are shown 'Out-of-Stock'. Serious current draw at 32 and 50 amps respectively, going to need a big alternator and a double sheave pulley.